Grooveshark is a web-based application for sharing music within a community of music lovers. 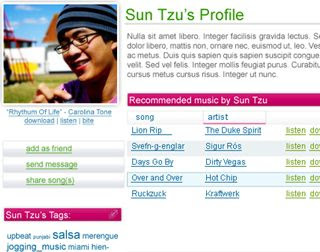 It distributes DRM-free MP3s across a p2p network. You can create public playlist, share your favorite music with others and get rewarded. Now, Grooveshark is a private and limited alpha version, so if you want join it you need put your email address on waiting list.